Alpacas for sale, also natural and hand dyed fibre. Spinning tuition. Alpaca fleece for sale - and a small number of alpacas for sale too! At the CraftWorks we have a programme of workshops, spinning groups and knitting groups that happen every week. Everyone is welcome. These are social workshops that last about 2 hours each but we do go on longer if time allows. They are designed to give you the opportunity to try new things and then develop those skills at your own pace or bring along a project you have already started. These workshops run alongside our more structured programmes and our masterclasses. We have all kit available including a variety of sewing machines, spinning wheels, looms, carders, etc. and some fabrics, wool and raw fleece but please feel free to bring your own if you would like to. The Craft Works is open from 10 am to 4 pm most days except Sundays and Mondays. Please feel free to pop in for a chat if you are passing. We always have a pot of tea ready to share. Shani is a handspinner, dyer and weaver, who produces heritage textiles with a "twist". Her company - Dyeverse - runs courses in colour, writing and textile construction, beginner through to experienced, in Wales and the South West. We are a group of fibre farmers, processors and users all living and working within or around the Blackdown Hills, an area of outstanding natural beauty straddling the Devon and Somerset border. Merino, BFL and Shetland Tops and angora fleece for spinners and felters available. Unusual and natural yarns from around the world for weavers and textile designers. Huge variety of books and patterns suitable for handspun. Workshops in spinning, felting, peglooming, knitting and crochet. There is also a monthly spinning group at the shop run by two Guild members, Jae and Terri, held from 6.30pm on the first Wednesday of every month - £2.00 per session. TUTLEYMUTLEY is Terri Bate, a handspinner, knitter and dyer, teacher and artist. Terri is willing to spin your pet fur as well as teach knitting and run spinning and advanced knitting workshops. ​DUNJA ROBERTS (our Skills day judge 2017); I teach from my purpose built textile studio on our working sheep farm, spin and weave to commission and supply Ashford and Louet equipment. I teach the only accredited courses in hand spinning in the UK. I also travel throughout the UK to visit schools and other groups. All in a Spin is based in the beautiful Brecon Beacons National Park, South East Wales, easily accessible from all parts of the UK. 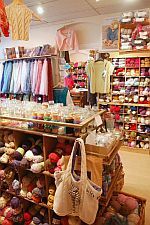 We specialise in beautiful and affordable British yarns as well as gorgeous hand-made gifts and accessories by local artisans. Fancy learning something new? Check out our calendar of workshops and drop - in sessions- we've got knitting, crochet, spinning, weaving, dyeing and felting for all skill levels. All of our workshops are taught by local folks who are very experienced in their craft. You'll also find lovely coffee, teas and delicious baked goodies from Emma's Bread in our cafe. Drop in any time and share your latest project with us! We're open Tues & Thurs 10 am to 8 pm, Wed & Fri 10 am to 6 pm and Sat 10 am to 5 pm. Closed on Sunday and Monday. John Arbon Textiles & Fibre Harvest - British makers of unisex socks, yarns and fibres. ​As John Arbon Textiles we are a small family-run business, nestled in North Devon producing a wide range of luxury socks in the UK. Sister company, Fibre Harvest, uses traditional worsted machinery to process & spin fine quality British yarns ... one of only a handful of small scale Worsted Mills still operating in the UK. Our production concept is simple – a return to the old style of textile manufacture ... sourcing raw fibre (locally wherever possible) & converting it in Britain into high quality hand knit yarns & the very sock yarn used to knit our luxury British made unisex socks. ​Janet Phillips, Hand Weaver, Fabric Designer and TutorI have been designing and weaving for over 30 years after studying industrial Textile Design at the Scottish College of Textiles, graduating with a First Class Honours Degree. ​Sue's focus is on creating three-dimensional woven sculpture suitable for public buildings as well as small-scale pieces for domestic settings both indoors and outdoors. Recently, following a Creative Wales Award from the Arts Council of Wales, her work has developed and now includes collage and woven silver brooches and bangles many of which stand as sculptures. I respond to ideas, shapes and geometry in nature and in life. The concepts for these structures are meticulously worked out yet they have emotional connotations and impact. They bring together pervasive themes in my life and art: encompassing the study of fine art, a fascination with geometry, an abiding interest in science and the environment, a deep understanding of the structure of yarn and the practice of weaving. Suzanne creates Nuno Scarves using local fleece, from sheep grazed on the hills surrounding her home (Somerset) and from the finest Merino fleece. Silk is used to produce a fabric incorporating natural dyes from local woods and her garden, to create designs inspired from nature. Imported dyes from traditional sources also achieve a colour palette to work from. This is our parent body - information about all other Guilds can be found on this site, along with information about the biennnial Summer School, the Certificate of Achievement and current events in the world of fibre-crafts. The Journal is the national magazine of the Association of Guilds of Weavers, Spinners and Dyers. It covers a wide range of textile subjects, and includes articles on historic textile techniques, as well as cutting edge modern design. The Journal is run by a small team of enthusiastic volunteers, and is published quarterly, in early March, June, September and December. Membership of the Guild gives a reduced subscription rate - see here. This virtual Guild was originally established to meet the needs of fibre and textile practitioners unable to be involved in their local guilds (although many members belong to their local guild as well). The membership is world-wide, and members have access to a wealth of information, a programme of workshops and the opportunity to take part in online discussions about craft-related issues. To visit the website please click here. The Campaign for Wool was officially launched by the Prince of Wales in February 2010. It has devised numerous initiatives to raise the profile of wool. The main players are representatives of the International Wool Textile Organisation, the British Wool Marketing Board and of Australian Wool Innovation, and key industry figures from the National Sheep Association, New Zealand, Norway and important sheep producing nations of the world. As well as leading figures from the fashion industry, the decorating and design industry, the wool carpets industry and the world of insulation and building, the Campaign works closely with manufacturers and retailers across the world - it is multi-national, multi-sector and inclusive, and tries to embrace all sections of wool users from the very largest companies to specialist artisans. This is the charity supported by the Devon Guild of Weavers, Spinners and Dyers. We make regular donations from the proceeds of various sales and raffles. (£310 in 2016/7). All logos: Copyright of their owners 2010, used with permission. All photographic images: Copyright of the Devon Guild 2010 and their owners.